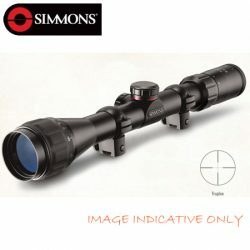 Since 1983 Simmons has established itself as a visionary leader in high quality high value rifle scope and binoculars. For over 25 years hunters and sportsmen alike have looked to Simmons for extraordinary optical innovation and rugged durability. Simmons 22 MAG 3-9 x 32 AO Truplex Rifle Scope Matte With Rings. 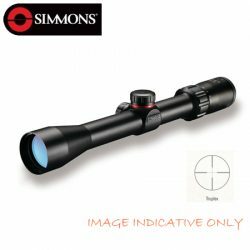 Simmons 22 MAG 3-9 x 32 AO Truplex Rifle Scope Silver With Rings. Simmons 22 MAG 3-9 x 32 Truplex Rifle Scope Matte With Rings. Simmons 22 MAG 3-9 x 32 Truplex Rifle Scope Silver With Rings. Simmons 22 MAG 4 x 32 Truplex Rifle Scope Matte With Rings. 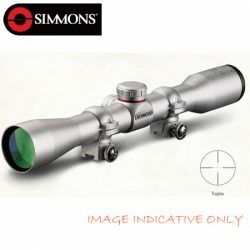 Simmons 22 MAG 4 x 32 Truplex Rifle Scope Silver With Rings. Simmons 44 MAG 4-12 X 44 SF Truplex Rifle Scope. Simmons 44 MAG 6-24 X 44 SF Mil Dot Rifle Scope. 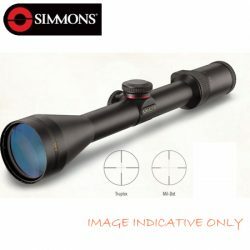 Simmons 8 Point 3-9 X 32 Truplex Rifle Scope.